AVERAGE OPPOSITION.COM: What happened to the great English Striker? Wayne Rooney is currently considered the only world class English striker and after his showing in Euro 2012 (and World Cup 2010 for that matter), even question marks have been raised over him. Runner up for the Premier League Golden Boot in both the 2009-10 and 2011-12 seasons, he's undoubtedly about more than just goals - but he's the closest English winner for the Golden Boot the league has seen since Kevin Phillips 30 goal haul in 1999-2000. That's twelve seasons without an Englishman top scoring in the English top division. Now this isn't a dig a Rooney - far from it, he's doing his best to live up to the fine goalscoring tradition of his fellow country men, and but for injury at the end of the 2009-10 season, he surely would have gone on to win the title that Drogba won. It's just that he's England's best forward, and he's not even the best striker at his club anymore - playing second fiddle to the man that beat him in the scoring charts last season, Robin van Persie. So when did it all go wrong for the English forward, and why? I've gone through the Top Scorers lists from the first Premier League season in 1992-93 (Englishman Brian Deane scoring the first goal) to the 2011-12 season - a nice neat 20 seasons, complete with a handy 10 year split. To keep things equal, I've only considered Premier League Goals, and although there were 42 game seasons until 1995-96, I've left them in as it was the same number of games regardless of the nationality of the players. In terms of threshold, it's the Top 10 ranked goal scorers for each season. In several occasions that was more than ten players as there were several tied on the same amout of goals. You almost get nostalgic looking back. Shearer, Sheringham, Wright, Fowler, Collymore, Andy Cole, Les Ferdinand. All top class forwards. Even Michael Owen scored over half of his goals in the first ten years of the Premier League. Then you had good players like Chris Sutton, Dion Dublin, Tony Cottee, Kevin Phillips and Kevin Campbell - good players and prolific in spells. 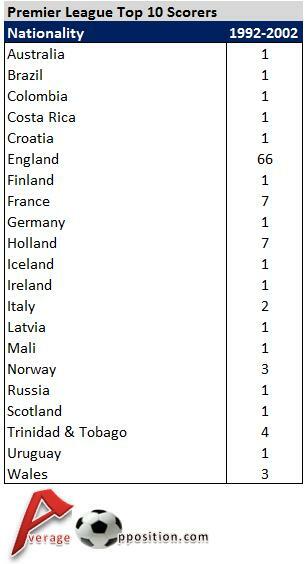 So 21 different nationalities were represented in the first ten years of Premier League Top Scorers. No real surprise to see that English players were in the Top 10 scorers on 66 occasions out of a possible 106 - with the closest nationalities being Holland and France with 7 entries each. The players involved? Cantona, Anelka and Henry for France and Bergkamp, Hasselbaink and van Nistelrooy for the Dutch, all legends of the Premier League, and all top class talents. The Americas are represented by just four entries - Juninho, Hamilton Ricard, Paulo Wanchope and midfield Gus Poyet. Somewhat surprisingly, there's only one entry from African players - with France born and bred Freddie Kanoute hitting 11 goals in 2000-01 (10th). The only other entries from outside of Europe were Australia's Mark Viduka, whose 17 goals in the same season, saw him finish in 4th place for the Golden Boot, and Trinidad and Tobago's Dwight Yorke who made the Top 10 on four occasions. Elsewhere, there's another surprise when looking at the Ireland (Quinn), Scotland (Gallacher) and Wales (Hughes, Saunders, Hartson), who had a combined five entries. Perhaps the rot for Scottish football in particular has set in earlier than some thought, but that's for another discussion. What of the English players? Well seven of the ten seasons saw an English winner - the first six seasons, followed by Kevin Phillips debut Premier League season in 1999-00. Shearer (three occasions), Andy Cole and Phillips all made or bettered the 30 goal mark, whilst Fowler (twice), Ferdinand and Sutton all scored 25 goals or more in a season. In total, the first ten years of the Premier League saw English players score 20 goals or more on 21 occasions. The standout stat and the the centrepiece of this article is the drop in English goalscorers - there's been a reduction of 50% in the Top 10 ranked scorers list. Whilst the likes of Shearer, Ferdinand, Sheringham and Cole were all still playing into the second decade of the Premier League, they were all on the way down and nearing the end of their careers. Owen and Fowler were still in their twenties but couldn't match the form they'd shown earlier in their careers - both saw a significant drop in their strike rates after leaving Liverpool. There were still good performances, of the 33 entries in to the Top Scorers from the English players, there were seven 20+ goal seasons - twice from Rooney, and one each from Shearer, Andy Johnson, Darren Bent and James Beattie. Making up the list is midfielder Frank Lampard. The interesting thing there is that the entries from Johnson, Bent and Beattie were exceptions rather than rules. Take Andy Johnson for example - aside from his debut 21 goal Premier League season, his other tallies were 11, 6, 7, 3, and 3. Hardly prolific. Similarly, James Beattie's 23 goals in the 2002-03 season were followed by 14, 3, 1, 10, 2, 7 and 2. Jermaine Defoe makes it into the Top 10 scorers list on just two occasions. He looks odds on to do so again this season, but it's quite a surprising stat from one of the better English Strikers in the second decade of the Premier League - especially for one known as a poacher. Scotland fall out of the equation all together, whilst Wales are restricted to just one entry - Craig Bellamy's 13 goals in 2005-06. Ireland fare a little better, largely thanks to Robbie Keane and one good season from Kevin Doyle. When comparing to the first decade, the influence from both inside and outside of Europe has grown in almost all cases. What has happened to the great English Striker? Obvious as it may be, the first and foremost reason and shown clearly above, is the number of foreign players is the largest factor. However, for every Henry, van Nistelrooy and van Persie, there's a Manucho, Boselli and Fuertes. In fact there's been several highly rated prolific scorers arriving in the Premier League with high hopes and expectations, but a relatively small fee. And that's the key point - the price. The market for English players is bloated beyond belief. It's easy to raise the example of Andy Carroll - £35m for half a good season in the Premier League. Michu costs £2m. Not really much to think about there. For all the sub standard players like those mentioned above, and the likes of Sava, Aloisi, and Mpenza, a home grown player is seeing their progress blocked. Last season saw Grant Holt score 15 Premier League goals - because he was given a chance. Danny Graham managed a decent 12 - just outside the Top 10. This season, Rickie Lambert is doing his best to follow in their footsteps. All English strikers who have scored goals in the top flight after spending most of their careers to date in the lower leagues. Add in Kevin Phillips, Dean Ashton and Marcus Stewart, and there's a case to be made for giving more players from lower leagues a chance. Why were they in the lower leagues in the first place? Well the influx of foreign players - both talented and not so, squeezes out English players. Looking at Jermaine Defoe again, he was sold from Tottenham the first time around as he was deemed surplus to requirements - Giovanni Dos Santos was one of the replacement forwards signed. Peter Crouch was also shown the door at Aston Villa, Liverpool and later Spurs. Players kept in his position include Marcus Allback, Andriy Voronin, Nabir El Zhar, and an ageing Louis Saha. It's a similar story for several English Strikers. Another element of the foreign influx is the standard of defender that's been brought in - Stam, Desailly, Bilic, Vidic et al, have all made life tougher for the forwards to score. To be clear, I'm not against Foreign Players, but wouldn't it be better if only those more talented than English players were brought in? Unfortunately, due to the transfer fees involved when buying British, clubs will continue to look abroad. This isn't restricted just to the second decade (Boogers, Silenzi etc..) but the frequency has certainly increased. Another large factor is that of formation. Looking back at the successful Premier League teams of recent years, and how many have actually played two up front? The death of the strike duo originated in Ferguson's quest to conquer Europe. The signing of Juan Sebastien Veron saw a move to a 4-5-1 or 4-4-1-1 formation, as he looked to sure up the midfield. That led to van Nistelrooy largely leading the line as the focal point, with runners from midfield working off him. And the next major change was with Jose Mourinho's introduction to Chelsea. The 2002-03 season saw a great partnership of Hasselbaink and Gudjohnsen - with Zola coming in regularly. The season after, it was Hasselbaink and Mutu. Under Mourinho, Chelsea moved to a 4-3-3 - with Drogba the lone striker, supported by two wide players - initially Robben and Duff, and later Joe Cole. That formation has remained in place up to the present day - the Champions League Final saw a £50m striker left on the bench as there was only one starting striking role and Drogba was ahead in form. That 4-3-3 also found it's way to Man Utd (Tevez/Ronaldo/Rooney), Arsenal, Spurs and just about all of the top clubs. This season, Liverpool are also playing it, as are City (at times). So what impact has this had to English Strikers? Well a few. The football upbringing of the average English striker is in a 4-4-2 formation for a start. As a result, they're often lacking experience in leading the line alone. It's also led to many players pushed out wide. In the 2008 title winning season, many will recall Wayne Rooney stuck out on the left wing - resulting in just 12 league goals that season. Similarly, the likes of Daniel Sturridge and Theo Walcott have seen their opportunities in a central role restricted. Sturridge has had to move to Liverpool in an attempt to play through the middle, whilst at the time of writing, it appears to be te sticking point for Walcott signing a new contract at Arsenal. A return to the 4-4-2 of old would see more opportunities for these type of players. Tied in with the change in formation, has seen one change in the scoring habits. That of the scoring midfielder. Looking at the Top 10 scorers by season in the first decade of the Premier League, there were seven entries from midfield (four of them were from Matt Le Tissier). Fast forward to the second decade and that increases to 17. 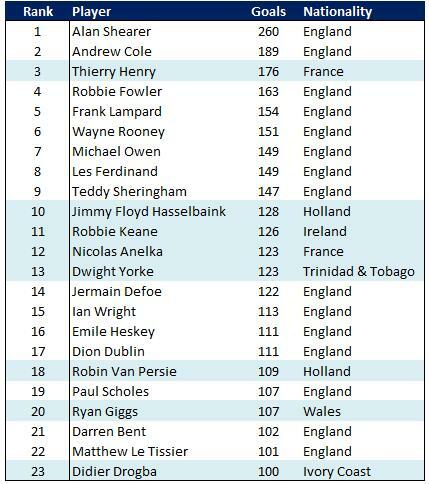 Pires, Scholes, Lampard, Gerrard, Dempsey and others have all made the Top 10 goal scorers. This season has seen Wales winger, Gareth Bale do the same. So whilst the goals are drying up for English strikers (and indeed all strikers), the frequency of the midfielders in the Top 10 scorers list has significantly increased. Whilst the change in formation and the price of English footballers remain as they are, it's unlikely that we'll see a return to prominence of the great English goalscorer. There are promising young talents such as Sturridge and Welbeck, but there's far too few of them to suggest a recovery. A quick look at the first choice forwards of each team tells a story. The dip in quality is best highlighted when looking at the England Squads for major tournaments. Euro 96 saw Shearer (31 goals), Sheringham (16), Fowler (28) and Ferdinand (25). Jump forward to Euro 2012 and Rooney (27), Carroll (4), Welbeck (9) and Defoe (11) were the forward options available to Roy Hodgson. In 1996, Ian Wright and Andy Cole didn't make the squad - both prolific strikers.